It's a lovely feeling. Finishing a project. Especially if it's a project that you've adored making and the finished item looks even better than you thought it would! So today I'm going to show you my finished Monsoon Stole. The stole was designed by Alia Bland from The Little Bee blog and can be purchased here. Scheepjes Cotton 8 is one of my all time favourite yarns. I have a very healthy stash of it! Why do I like it so much? Well... it's a pure cotton that doesn't split for a kick off. 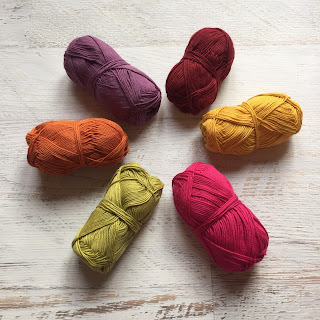 Splitty yarn drives me insane! The twist in this yarn is just enough to keep it from splitting but not too much that the yarn is stiff. This yarn gets softer and softer the more you handle it. It's a 4ply weight yarn that you can throw in the washing machine without stressing (although I would recommend using a colour catcher if you have a wide range of colours in one item...just to be safe!). 50g gives you 170m of yarn at the bargain price of £1.99! (you can buy it here!) Recommended hook size is 3mm but I vary this according to the finish I want. Oh and the colours.....46 delightful shades! And that's not including the Sunkissed collection. I used a 4.5mm hook to give a lacy appearance. The pattern was very easy to follow and beautifully written. There are lots and lots of photos to follow so know exactly what the pattern should look like when finished. Because of the mixture of stitches used in this design, blocking is essential! I used my trusty play mats and some blocking wires to pin out after I had given it a good soak. Ok enough talking....let's take a look! I love how these colours work together! I made the section worked in the Bordeaux colour longer. I just adore the lacy edge! And there you have it! My version of the Monsoon Stole. Whilst it looks like a complicated pattern, it was very quick and easy to make. I finished it in a weekend! I may have to make another! It turned out great! Especially the colours work out fab! Absolutely love it, both the pattern and Your colorchoice. I am going to make one in mint, white, grey and lilac. Oh, I saw your stole on Alia's page and said, it looks like spices on a market or flowers right after the rain. So beautiful! And the perfect colorway! I absolutely love your stole! Ik love the colours, they work so well together!